Dr. Rock's Blog & Roll: Album of the Day: Cream (11/2/67) 42 years! 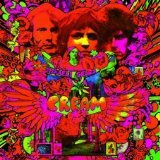 Album of the Day: Cream (11/2/67) 42 years! Disraeli Gears ranks #9 on my list of the Top 25 albums for 1967 and #112 on the Rolling Stone 500 Greatest Albums of All Time. It is available as download tracks from iTunes (click here) and as a CD from Amazon (click here).